The city was crowded – people came from all over the nation and beyond in the hopes of finding employment and a prosperous life. There was entertainment at every street corner. Construction was unending. The city was on the open road with nothing ahead but a clear track for driving. Every day was a perfect picture of optimism. Flint roared with the rest of the nation in the decade that gave us the 19th Amendment granting women the right to vote, prohibition, the birth of “talkies,” Disney, Lindbergh’s flight and unbridled excess. This was Flint in the 1920s – unstoppable in vision and immeasurable in charm. In 1920, Flint was entering its heyday. General Motors (GM) had begun to take over the vehicle manufacturing world and autoworkers were filling the city. In order to offer a place for its workers to live, GM provided funding for the Civic Park Subdivision providing 950 homes. Civic Park was a continuation of a project started during the first World War by the Civic Building Association and was based on the earlier plans of architect William Pitkin and the New York firm of Davis, McGrath & Kiessling. The speed of the city’s growth provided ample consumers and a need for entertainment and lodging. To provide visitors to Flint with lodging right in the thick of downtown life, the Hotel Durant was completed and would remain the city’s premier hotel until 1973. The Durant Theatre (later the Roxy Theatre) opened on Broadway Boulevard offering weekend entertainment until its demolition in 1971. For citizens seeking bigger thrills, the Flint Amusement Park was built on West Stewart Avenue, just off the south shore of Flint Park Lake. During its lifetime, the facility provided the fun of a Ferris wheel, a rollercoaster (called the Jackrabbit), a water ride and more than five other major attractions. Many performances by noted artists took place at the park, the most impressive being singer, Ella Fitzgerald. The park would have its share of controversy during its lifetime, also. Two deaths occurred on rides, a fire destroyed a portion of the park and the fabled Beecher Tornado (1953) did nearly insurmountable damage to many of the rides. The park finally closed its doors in 1961 and was subsequently demolished. As the city blossomed, that gambler, Billy Durant, finally took one risk too many. Riding high into the 20s, his confidence soared as he continued to make deal after deal. During his dealings, however, he forgot to do one thing: run GM. He remained aloof to those who answered to him and soon enough, was forced out of GM for the second time, never to return. A recession hit that threatened the GM stockholders, and one more negative business deal sealed Durant’s fate. In order for GM to survive the recession of 1920, a reorganization was in order. The company’s largest shareholder, Pierre Dupont, reluctantly took over as president and steered the company successfully until 1923. In 1921, a group of Catholic nuns opened a hospital in the Thomas Stockton house on Ann Arbor Street, soon renovated to add 23 more beds. St. Joseph’s hospital grew and 15 years later, moved to its permanent location on Kensington Street where it operated until 1997. Robert J. Whaley, President of Citizens Bank for over 40 years, died from unexplained health complications in 1922. His death established the Donald M. Whaley Memorial Home, named after his son, who died from diphtheria years prior. Funds were also allocated to St. Paul’s Episcopal Church which resulted in the creation of the Whaley Children’s Center. His wife, Mary Whaley, left their residence which became a home for elderly women upon her passing in 1924. The McFarlan home was established for this purpose upon her death in honor of her parents, Alexander and Margaret McFarlan. In 1922, area residents were treated to broadcasts from Flint’s first radio station, WEAA, brought to citizens courtesy of Frank D. Fallain (who would change the call letters to WFDF in his own honor in 1925). Most likely, students listened to that radio station at the newly-built Flint Central High School. Never to be stopped, the rascal Durant went into auto production on his own. He declared the newest vehicle produced in the city would be uniquely called “The Flint.” It failed three years later. GM hit a milestone in 1923 when Buick produced its millionth vehicle. The corporation would change hands once again the same year, as the former president of the Hyatt Roller Bearing Company (purchased by Durant in 1916), Alfred P. Sloan, took over for Pierre Dupont. Under Sloan’s leadership, GM became the world’s leading automaker. Previous Ford employee, William S. Knudsen, took over as general manager of Chevrolet. Another Flint classic was born in 1923 when Samuel V. Blair opened Kewpee Hotel Hamburgers. He operated the business until 1944, when Bill Thomas would take over and change the name to Halo Burger. In 1924, a tumultuous year for the city of Flint, Mayor David Cuthbertson was the first Flint mayor to be recalled. After his election, Cuthbertson named James P. Cole, a Catholic, police chief. This angered some citizens of Flint, including many members of the Ku Klux Klan who had recently arrived to spread their form of hate in the city. The outcry was enough to get Cuthbertson recalled. Judson L. Transue would assume the mantle of mayor soon after, and ironically, would choose to keep Cole as chief of police. This strange situation overshadowed the young men of Flint Central as they won the state football championship led by all-state players, Herm Young and Lloyd Brazil. Detroit Publishing Co, C. C. & Detroit Publishing Co, P. South Saginaw Street, Flint, Michigan. Flint Flint. Michigan United States, None. [Cbetween 1915 and 1925] [Photograph] Retrieved from the Library of Congress, https://www.loc.gov/item/2016816910/. The Charles Stewart Mott Foundation was created in 1926, with C.S. Mott providing a permanent endowment of 2,000 shares of GM stock. With an initial emphasis on education, health and the arts, the Foundation gave Mott a way to express his affection for his adopted community. The first donation was $1,000 to Christ Episcopal Church. In early 1927, workers were still flooding in from all areas of the country and boarding opportunities were growing scarce. Manufacturing was going so strong that the companies could not afford to turn anyone away. To help alleviate the problem, Fisher Body opened dormitories with room for 600 men. In the meantime, construction continued. William A. Atwood presented a site alongside the river for a stadium. Atwood Stadium was completed in the summer of 1929 and would be Flint’s penultimate outdoor sports arena through present day. With the sheer number of theatres operating in the city at the time, it only made sense that a performance troupe would be created. In 1927, the Flint Community Players were founded by Bertha Creighton and Robert K. Adams, and the first performance was a comedy called “Meet the Wife,” staged at Central High School. The Flint Community Players are the longest-running continuous community theatre group in Michigan. Entertainment in Flint was still going strong in 1927 when the Industrial Mutual Association (IMA) finished its civic structure containing roughly 6,000 seats. It was the premier spot for entertainment in the Downtown area, hosting concerts, shows, sporting events and more. The last performance at the IMA was a Peter Frampton concert in 1979. It was demolished in 1997. Art in Flint was becoming high society and, in 1928, George Crapo Wilson founded the Flint Institute of Arts, which moved in the 1950s to its current location in the Flint Cultural Center. At the height of the theatre craze of the early 1920s, construction started on a building at the corner of Harrison and 2nd Streets, and in 1928, the Capitol Theatre was completed. The building originally housed 12 shops, 50 offices and 11 bowling lanes. It would be one of the few Downtown theatres to survive to current day. In 1928, Northern High School was opened on McClellan Avenue as the city’s second high school. Shortly afterward, the first Central-Northern Thanksgiving Day football game was held at Dort Field with the Northern Vikings triumphing over the Central Indians by the score of 7-0. Joe Supak was the hero, as he plunged into the end zone after Northern recovered a fumble near the Central goal line. The end of the decade brought about a major change for city government. Flint voters approved a charter, forming a council-manager government and the city council was born. Also, in 1929, Reverend Norman A. Dukette founded Christ the King Catholic Parish, establishing the area’s only black parish. Dukette, at the time, was the only black priest in the entire diocese of Lansing. At the tail end of 1929, scandal was the word of the day, when high-ranking officials from the Union Industrial Bank (UIB) Downtown were caught embezzling and then gambling away approximately $3.5 million of the bank’s money. The stock market was booming the previous year, and everyone wanted a piece of the pie. Fifteen officers (or “The League of Gentlemen” as they came to be known) of the UIB plotted to invest depositors’ money in the market. The plan was hatched by bank Vice President, Frank Montague and involved the bank president’s son. When the stock market crashed on October 29, 1929, the game was up. The account of what happened next differs depending upon source, but what is not disputed is that upon losing the money, some officers complicit in the plot contacted C.S. Mott, who was then on the bank’s board of officers. He immediately met with the “League of Gentlemen” and immediately demanded their resignations. Mott then spoke to city prosecutor, Charles Beagle. The subject matter of their conversation is unknown, but two different stories have emerged. Harding Mott, the son of C.S. Mott, insists that his father gave Beagle only the facts and made no effort to influence the prosecutor. Jon Beagle, the son of Charles Beagle, claims that Mott pressed his father to not prosecute for fear of scandal and Beagle, of course, upheld the law. Jon then goes on to state that in retaliation, Mott ran a successful campaign to force his father from office. The “League of Gentlemen” were not the only ones to lose a fortune in the stock market crash of 1929 – poor Billy Durant lost much, much more. It was believed that at the time, Durant owned nearly a billion dollars’ worth of stock in multiple avenues … and he lost it all. 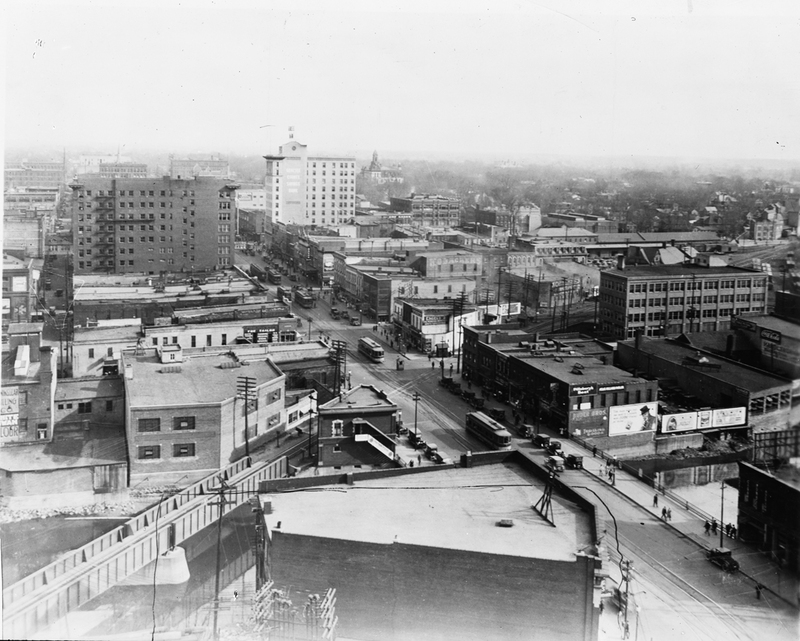 The 1920s were some of the most prosperous years for the City of Flint. Most of the buildings and institutions that we see today were built during that amazing decade. The next ten years would slow, but continue the upward trajectory not only for entrepreneurs, but for their workers, as well – and our tragic hero, good ol’ Billy Durant, would leave the automobile business forever. Flint’s National Guard Armory building opened. YWCA opened a new building. Charles Lindbergh flew “The Spirit of St. Louis” over Flint. Flint’s first Kresge store opened. The Michigan Theater opened on S. Saginaw St.
Flint’s first zoo opened in Forest Park. Detroit Publishing Co, C. C. & Detroit Publishing Co, P. South Saginaw Street, Flint, Michigan . Flint Flint. Michigan United States, None. [Cbetween 1915 and 1925] [Photograph] Retrieved from the Library of Congress, https://www.loc.gov/item/2016816910/. Thomas, G., & Morgan-Witts, Max. (1980). The Day the Bubble Burst: A social history of the Wall Street crash of 1929. Penguin Books.